Yesterday I visited the Auschwitz-Birkenau extermination camp, about 50km west of Krakow, Poland. It is a place I have always wante to visit, indeed it is a place, that personally, I have told myself I must visit, owing to the significant historical and humanitaria (or lack of it) story that the site has to tell. We were lucky enough to have a supremely knowledgable tour guide to take us around both Auschwitz I and Auschwitz-Birkenau. His knowledge and wisdom really did bring the whole place to life. 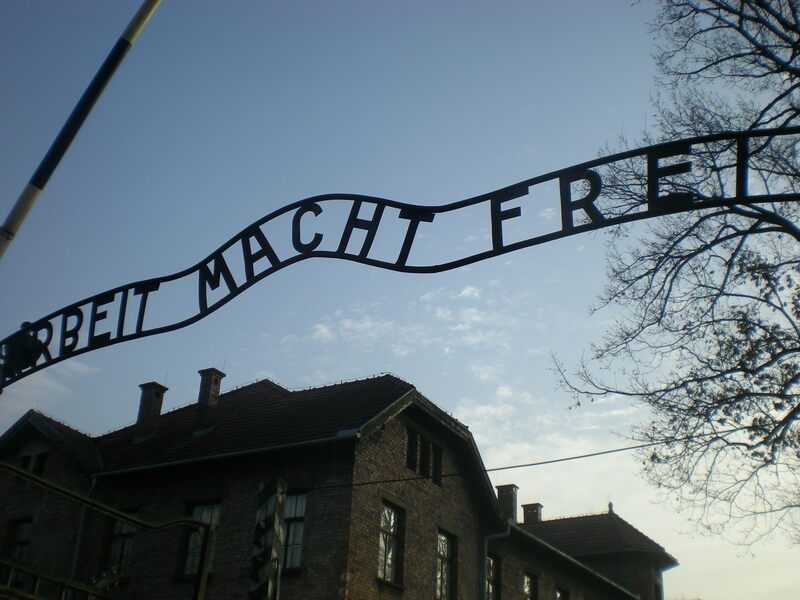 Auschwitz I is a living museum. It is still very much in tact as it was in the 1940’s. Many of the original baracks have been transformed into exhibitions about various aspects of camp life: for example working conditions, sanitary conditions and punishment. There is also the original crematorium (Crematorium I) that has still survived. 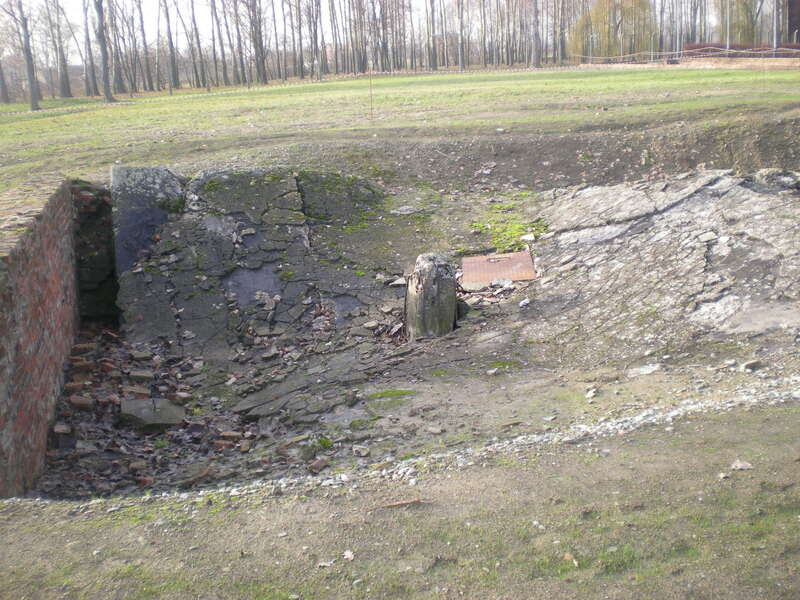 This particular structure resembles an air raid shelter (because that is what is was used for after the construction of the huge gas chambers/crematorium of Auschwitz II). Walking into this crematorium, standing in the exact same place where thousands of people were gassed, looking up to the roof to see the holes where the zyklon B was poured in by the SS guards and then seeing the furnaces that burned the bodies is something that will stay with me forever. Block 11 of Auschwitz I is the ‘prison within a prison’ where any inmate who fell foul of the numerous camp regulations would end up. This was (and still is) a particularly brutal place, for me it was the standing cells that hit home. These were tiny cells (about 1.5m square) with a metal hatch at the bottom where the prisoners climbed in. Upto 8 (yes, eight) prisoners were confined in each cell, squashed right up against eachother – with absolutely no choice but to stand up all night. Ventilation was offered by a tiny hole in the wall, it must have been hell. Image standing in one of these concrete cells all night, pitch black, squashed against 7 other stinking souls, no ventilation, no air, then, when morning comes you go to work – hard manual labour for 12-15 hours, then back in to the standing cell for another tortuous night. Some inmates suffered this for a whole week. Brutal. Unimaginable to you or I. 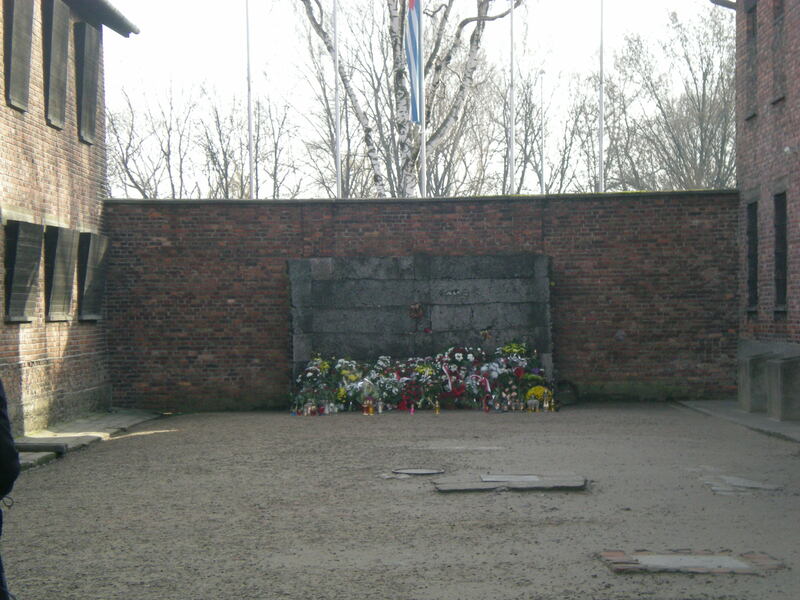 Next door to block 11 is the execution yard, with its wall of death where thousands of prisoners were executed at the whim of the camp SS guards, or strung up with their arms behind their back on wooden posts – which still survive today. 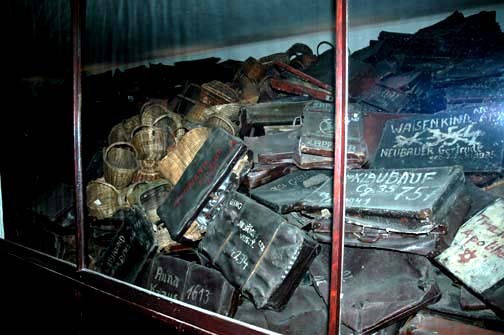 For me the most distressing part of the whole tour was learning about the individual stories and seeing the evidence of inmates…One room has a display of suitcases – thousands and thousands of suitcases, all with the name and address of the owner painted on them. Our guide pointed out a few names and told us the stories about the people behind the names…a girl of 3, a baby boy of 1, teenagers, pensioners, veterans of WW1…all exectued on arrival. Then there was the huge pile of shoes (the exhibit was about 20m long and 3 or 4m high…just think about that for a second..thousands upon thousands of shoes. There were other similar exhibits, pots and pans, a mountain of spectacles, then the one that did it for me…..an enourmous mountain of human hair – womens hair. There is approximately 7 tonnes of hair in this one exhibit, evidently that is about 140,000 people. All the hair was grey, caused by the passing of time, apart from one lock which was still vibrantly red. The hair from one hundred and forty thousand women. You can clearly see the plats, curls etc…until you have seen such a thing it is difficult to imagine, but let me tell you it is a harrowing, harrowing site. It becomes even more distressing when you realise these items are just a tiny fraction of the total that was generated in this camp. These were only the items that were discovered by the Russians in 1945. The vast vast majority of hair had been sent to manufacturers in Bavaria and Germany to make items such as blankets/uniforms for the war effort. 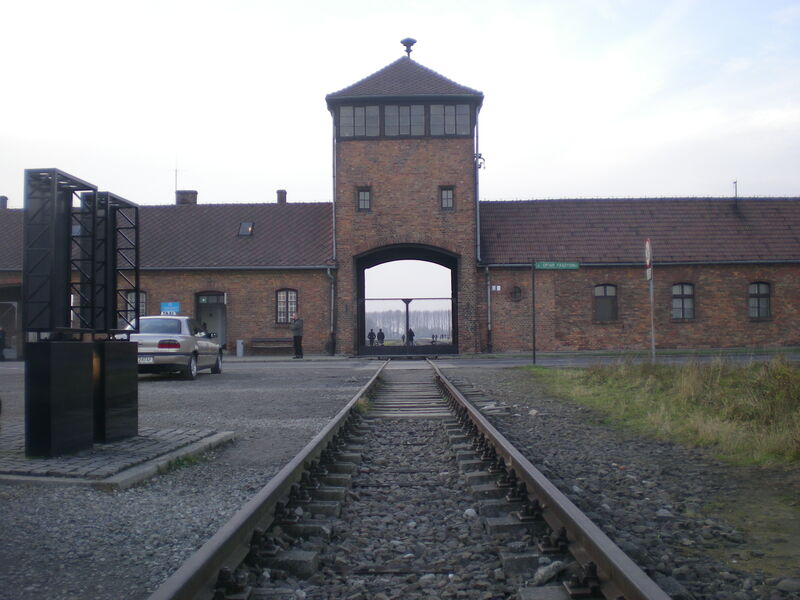 A short drive to Auschwitz-Birkenau and we were face to face with that guard tower and that railway track…seeing it in the flesh kinda knocks the wind out of you. Trying to comprehend how many trainloads of people passed the very spot you are standing straight to their death is simply not possible for my little feeble brain. It is not until you see Birkenau for yourself you understand the sheer scale of the place. It is enourmous. There isnt much left of it now: the crematoria were destroyed by the SS in 1945 and the majoity of the wooden barracks were destroyed by a mixture of the SS and Russian army. However, the brick chimneys/heating system of each hut is still there and acts as a kind of individual memorial for those poor souls that lived, suffered and died in each of the barracks. Tracing the route of the railway line you come to the siding where the selection process took place. It was here where the SS Doctors decided the fate of the prisoners. Those they thought could work were sent to the camps, those who were too old, too young, or disabled were sent straight to the gas chambers. We traced those tragic footsteps – 380 metres from the siding to crematorium 2 – silent in our own thoughts. Earlier this month I was lucky enough to cycle in the footsteps of heroes whilst cycling the WW1 Western Front. Now, I was walking in the shadows of death. Several months ago I posted a question on Linkedin about the ruins of the Crematoria in Auschwitz-Birkenau. I asked whether they should be preserved or left to rot as nature intended. My gut feeling at the time was to keep them and preserve them as much as possible. By preserve I dont mean rebuild, but try to stop the natural erosion of the relics. The online discussion was very intense with many people having strong opinions one way or another. After visiting the site my view is now equally as strong. We have to preserve as much as we can. We have to teach future generations of the awful atrocities that were carried out at Auschwitz with the hope that they learn from the mistakes of the past. Thank you for posting a passionate & powerful posting.